Yesterday, at 18:30 local time EUMETSAT took control of Metop-B operations, following the three-day Launch and Early Orbit Phase conducted. The handover follows the launch of Metop-B on 17 September. Since the launch all of Metop-B’s systems have been deployed and checked. This has included its crucial solar arrays that provide crucial power to run the satellite and its 11 scientific instruments. Other checks have included the power, temperature, software, telecommunication links, the deployment of five payload instrument antennas and the use of one thruster burn to fine tune the orbit to bring it into ‘phase’ with the orbit of its sister satellite Metop-A . Since the handover of the satellite to EUMETSAT control, work has immediately begun on the in-orbit verification of the satellite, during which all Metop-B’s 11 instruments will be switched on over the next six weeks. Altogether, these instruments will deliver measurements of vertical profile of temperature, humidity and trace gases in the atmosphere, the wind field at the surface of the ocean, and soil moisture. The Metop-B in-orbit check out activities will use the comprehensive EUMETSAT Polar System (EPS) ground segment. They will be coordinated by the EUMETSAT Control Centre located at EUMETSAT’s headquarters in Darmstadt, Germany, with the support of ESA, the French space agency CNES, NOAA (National Oceanic and Atmospheric Administration) and industry. The Metop satellites are Europe’s first operational meteorological satellites in polar orbit. They constitute the space segment of the EUMETSAT Polar System (EPS) delivering data for numerical weather prediction (NWP) – the basis of modern weather forecasting – and climate and environmental monitoring. 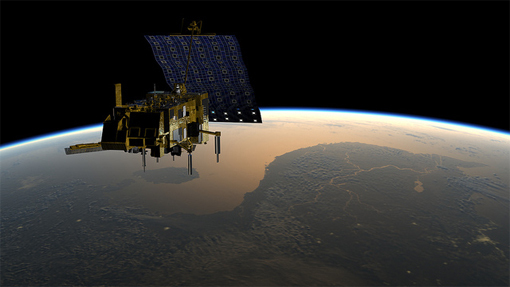 Flying at an altitude of 817 km, each Metop satellite carries the same sophisticated suite of instruments providing fine-scale global data, which can only be gathered in the low Earth orbit, such as vertical profiles of atmospheric temperature and moisture, wind speed and direction at the ocean surface, and some atmospheric trace gases. Observations from Metop-A have significantly improved weather forecasts up to 10 days ahead. These forecasts are essential to protect life and limit damage to property, but they also benefit the weather-sensitive sectors of the European economy, especially energy, transportation, construction, agriculture and tourism. The three Metop satellites, launched sequentially, will provide continuous data until 2020. The first satellite, Metop-A, was launched in 2006, and the third and final satellite, Metop-C, is scheduled for launch at the end of 2017. This entry was posted in Met Office in the Media and tagged Darmstadt, EUMETSAT, EUMETSAT Polar System, European Space Agency, metop, Metop-B, National Oceanic and Atmospheric Administration. Bookmark the permalink.